"Loud Calls & Wrist-Worn Visual/Vibrating Ringer"
Enjoy loud, clear interference-free calls amplified up to 50dB and hear the buttons you press announced to ensure accurate dialing. Know when the phone is ringing - and exactly who is calling - with the flashing bright white LED visual ringer and talking caller ID. Plus, this combo comes with a compatible Wrist Shaker accessory that alerts you with a visual LED signal and vibration if the connected PowerTel 720 phone rings. And on top of these accessible features for the hard of hearing, you'll get cordless convenience, a hands free speakerphone and an answering machine, as well! 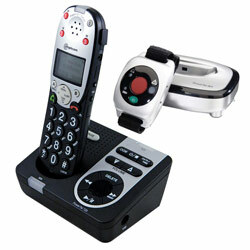 The hearing aid compatible PowerTel 725 Reliant-Plus Amplified Dect 6.0 Cordless Telephone with Answering Machine and Speakerphone Plus PT601 Wrist Shaker makes keeping in touch with friends and family easy, and all your telephone calls a pleasure! - 2 flashing LED visual ringers and missed call alert.